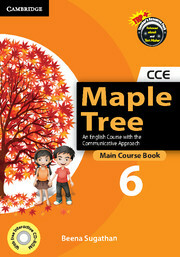 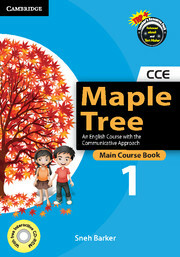 Maple Tree − An English Course with the Communicative Approach is an eight-level Series. 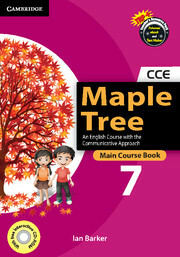 Prepared in adherence to the guidelines laid down by the NCF (2005) and the requirements of CCE, Maple Tree, An English Course with the Communicative Approach, is a complete and comprehensive series of books for classes 1-8, aimed at developing the four skills of Listening, Speaking, Reading and Writing in an interesting and enjoyable way. It simultaneously aims at creating a strong foundation for honing the sub-skills of Grammar, Vocabulary and Pronunciation to further facilitate the acquisition of the key skills of LSRW. 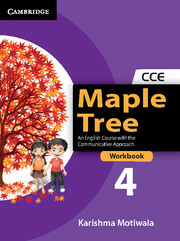 Detailed and comprehensive coverage of the four skills of LSRW. A wide range of texts from different genres and literatures. Skill-orientated tasks and exercises in every chapter. A carefully graded grammar syllabus across the whole series. Four sets of Formative Assessment Test Papers at each level as per CCE guidelines. Two sets of Summative Assessment Test Papers at each level as per CCE guidelines. Theme-based Formative Assessment Tasks at the end of every unit. 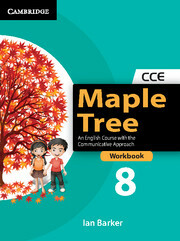 Further reinforcement of skills through Workbooks. 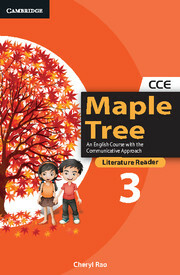 Honing of the skills of literary analysis and appreciation through Literature Readers.